Play Christmas songs (or jingle bells!) 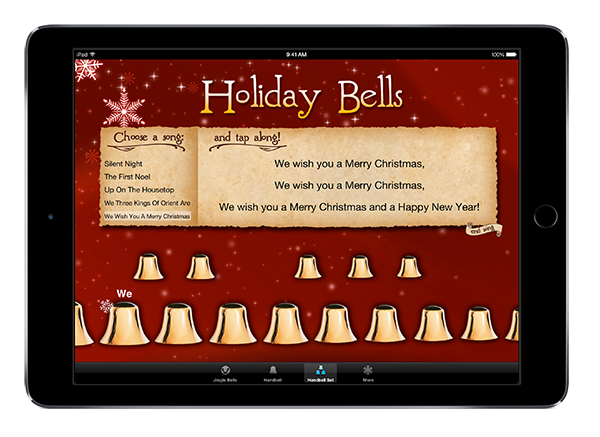 on your iPad with Holiday Bells! The iPad version has the song list, lyrics, and handbell set on one screen. Choose a song from the list, then follow the snowflakes to play it on the bells... or tap "Auto-play" to have the app play the song for you! Play handbells on the big screen with Holiday Bells for Apple TV! 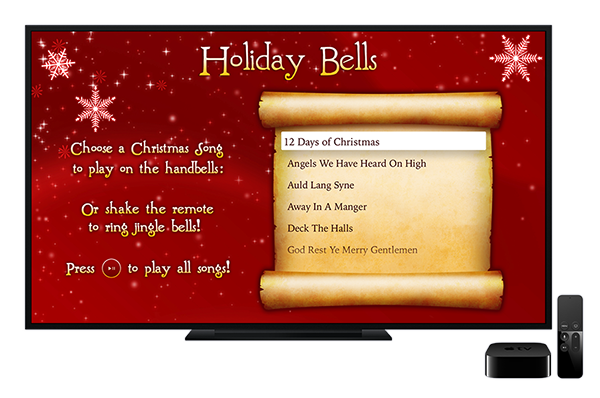 Choose a song, then swing the remote to ring the bells, or press play to auto-play the songs. Or press play from the song list screen to auto-play all the songs! Play Christmas songs (or jingle bells!) on your iPhone, iPad, or Apple TV with Holiday Bells! With a full octave of handbells and 20 Christmas songs you can tap along to, it's great fun for the whole family! Jingle Bells: tap, or shake the phone to ring the bells. Fun for kids! Handbell: tap the bell or swing to ring. Tap on the clef to change pitch. Songs: 20 tap-along Christmas songs, with favorites like "Jingle Bells", "Away in a Manger", "Joy to the World", and more. Scroll the songs list to see them all. Select a song from the list, then follow the snowflakes to play it on the bells... or tap "Auto-play" to have the app play the song for you! Very easy to play - no music experience required! The sounds you hear in Holiday Bells are real handbells!